Most people around Central New York are staring at the trees right about now, considering the leaves, hoping and wishing for that lone last burst of color. Robert Hoadley is thinking about other matters when he surveys the many trees on his 140-plus acres of land. When the leaves drop, it's time for what Hoadley calls the Fall Dig. 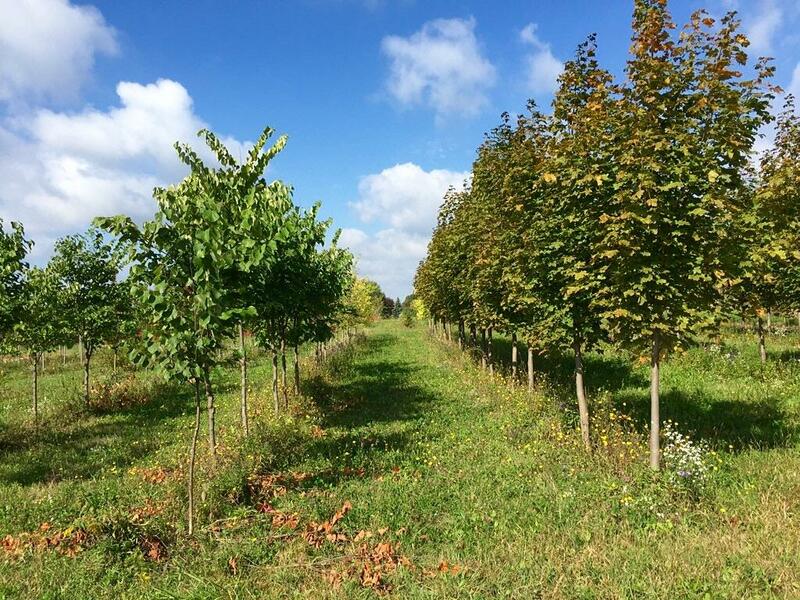 On the road between Owasco and Auburn sits a tree farm and nursery. The 34-year-old grew up among these rolling hills in Owasco. Two generations ago, his grandparents ran a poultry farm on this land, Hoadley explains while he sits in his pickup truck in the well-worn lot just off the south side of Route 36A. 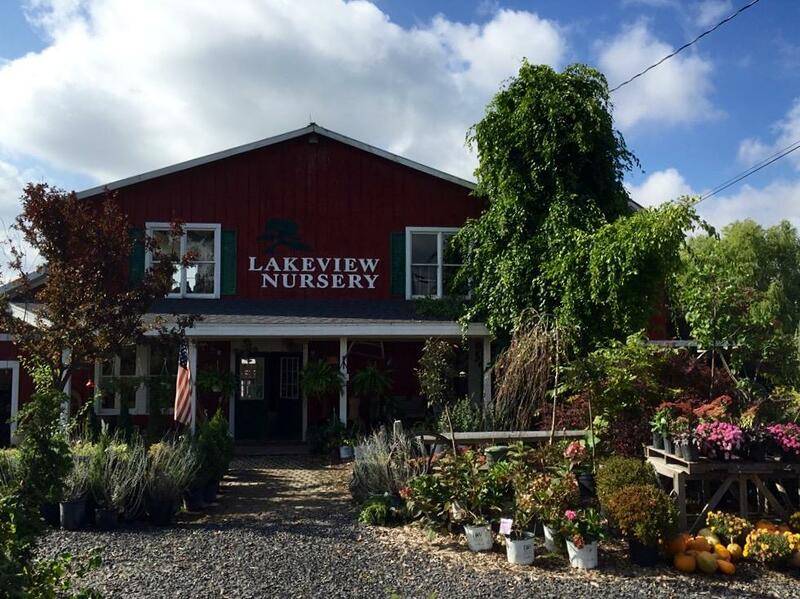 The address is 5603 East Lake Road, to be exact, and the sign outside lets visitors know they've found Lakeview Nursery. "A long time ago," Hoadley says of his grandparents, chuckling at the idea of the birds. "My father would get turkeys for the heck of it, to keep it going. Then he started the nursery, oriented toward landscape." Indeed, after graduating from Auburn High School, Hoadley went to SUNY Cobleskill, majoring in landscape design and ornamental horticulture. "I picked up a lot," he says of that education. "Attaching Latin names to things, for instance. But you pick up more doing it. I'm still learning. They keep coming up with new stuff." It took a terrible accident for Hoadley to decide this is where he was supposed to be. On Dec. 13, 2003, the car Hoadley was driving hit black ice on nearby Court Line Road. His car collided with a tree. Hoadley lost the use of his legs. 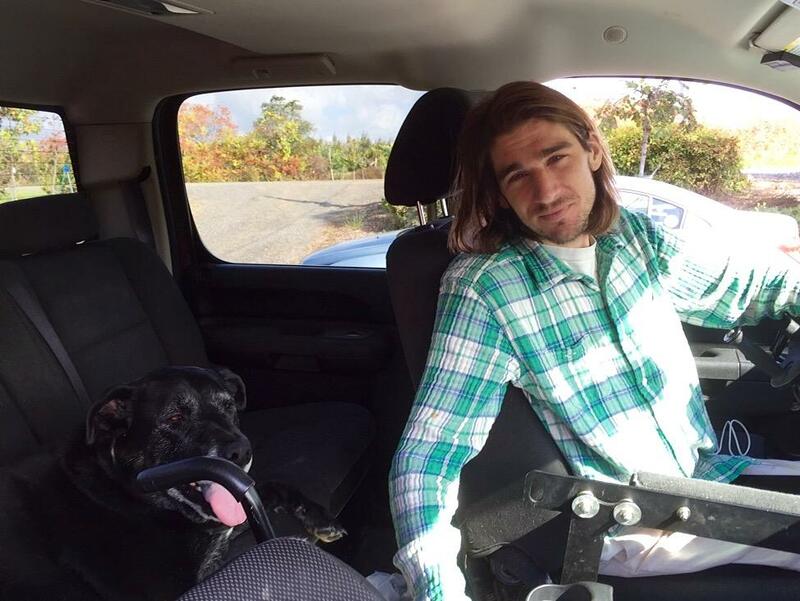 Robert Hoadley and Charlie, in Hoadley's custom pick-up truck. "Yeah, they're lots of help," he says, poking a bit of fun at Charlie and Barney. "Yes, it affected me," he says, dogs Barney -- a girl whose full name is Barnice -- and Charlie lying in the back of his specially equipped truck that allows him to drive with his hands and allows best personal maneuvering inside. "I didn't do anything for awhile. That's not right. I did a million things. But I had to figure out what I wanted to really do. "I started the nursery thing a year after the accident," Hoadley says. Eventually, he bought it from his parents, and switched the emphasis from landscape to retail. Indeed, the nursery store is open 9 a.m. to 5 p.m. Monday through Saturday, until Nov. 1. During the winter, he'll still sell, but private buyers must call first at (315) 252-1281 to make an appointment. "I expanded (the tree growing area) by 1,000 times," he says. Anival Martinez Gomez works the digging spade at Lakeview Nursey. There are 60 acres of shade trees alone growing on the property, on both sides of the road. Hoadley buys them when they are bare-root whips, he says, and plants them in rows out in the field. He leaves them to grow there for three or four years, he says, and then they're ready to sell. Landscapers can buy through the Hoadley's Wholesale Nursery part of his business, and house owners through Lakeview Nursery. Then autumn comes, and his Fall Dig. He's sold more than 100 that will be taken out and moved soon. Landscapers usually come and pick them up themselves. For home owners, he'll deliver and even plant. "We'll install for you," is how he puts it. Another couple hundred he'll spade out of the ground with a big ball root to plant into mulch, where they can survive for two years or more until somebody purchases them. "I have large, 6-inch (trunk), 30-foot (high) trees I sell," he says. "And they're priced reasonably. I'll have landscapers call me in December for trees." Hoadley estimates he grows trees on 80 of his 140-plus acres. Hoadley employs three full-time and one part-time worker. He has an opening for a fourth full-timer come next busy season. His current crew, he says, all have been with him for several years. They're from Guatemala, he explains, after calling Anival Martinez Gomez on his cell, and asking him in Spanish to prep and bring over the motorized spade for a demonstration in the field. Gomez recently told him he'd like to bring his wife and children from Guatemala. "They live here and oversee the property," he says of his full-time workers. "I don't know what I'd do without these guys." During spring and fall, the nursery takes up most of his time. "I would say the nursery dominates my life," Hoadley says. "It takes up most of my energy, six or seven days a week. I don't have much time for anything else." Hoadley used to live on the property, too, "Too much nursery," he says, "so I moved (five or so miles down the road)." Still, he looks at the dormant second-floor of the building, where his parents used to run a gift shop, and thinks it might make a swell space to live. During the slower summer and winter, Hoadley likes to travel abroad. He just came back from two weeks in Panama and Colombia. "I should go to Europe, but I feel at home down there because I know folks," he says. Plus, he speaks Spanish. Now it's back to business, moving those trees. "With heavy equipment. 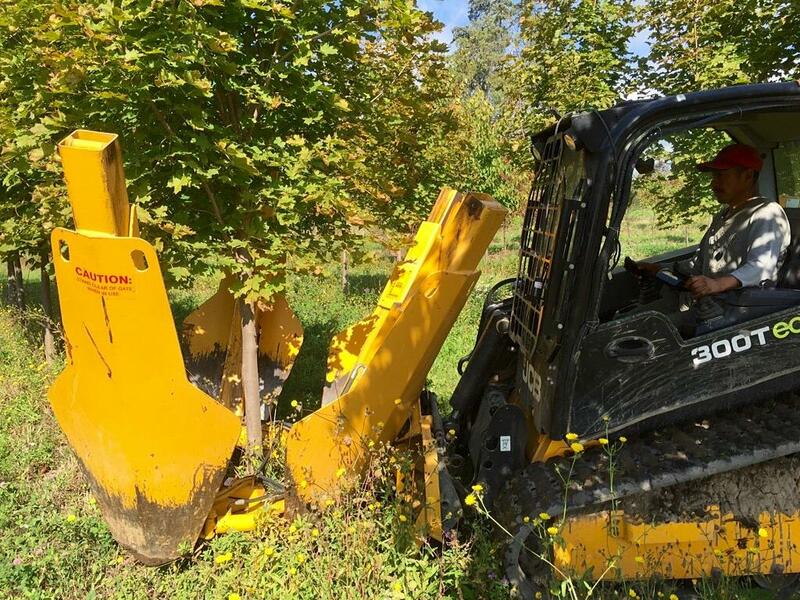 Digging spades, tractors, tree jaws," Hoadley explains. "People are doing their fall planning, and the phone rings more. I'm fully loaded with hundreds of varieties. And we'll have 13 to 15 of every variety. Not just one or two." You can find more of my photos from Lakeview Nursery at my blog, markbialczak.com.